If you were to go to a master woodworker’s shop, you’d invariably find a plethora of tools that he or she uses to accomplish various tasks. In software it is the same. You can measure a software developer by how they use their tools. Experienced software developers master their tools. It is important to learn your current tools deeply, and be aware of alternatives to fill in gaps where your current ones fall short. With that in mind, I present to you a gigantic list of tools. Some of these I use daily, others I see potential in. If you have more tools you’d like to see here, just make sure to add a comment. I tried to categorize these the best I can. Some of the entries are websites, some are back-end services, but most are apps that you install. Not all of the apps are free, so I’ll make a note with a $ to denote that an app costs money. pttrns – A great library of iOS screen designs categories by task. If you want to see how other apps handle activity feeds, for instance, this is a great place to go see a bunch of examples. TappGala – Another great collection of nice app designs. It’s not categorized by task, but is just a list of great apps to get inspiration from. Cocoa Controls – A great list of components (code) that you can use in your iOS apps. Sometimes you’ll find great pieces of code that can save you time, other times you can just learn how other developers accomplish certain features. Subscribe to their weekly newsletter; all signal, little noise. IICNS – A collection of really great icons. Get inspired, but don’t copy. Dribbble – Some of the best digital designers post up their work for all to see. A treasure-trove of designs to look at. Capptivate – a gallery of inspirational designs. Some contain animations. Thanks, @joaopmaia! Mocks ($) – An easy to use tool to create a quick mockup of an iOS app. Comes with a bunch of the default controls you can use to assemble something quickly. Briefs ($) – A really useful app that allows you to create a mockup of an app and stitch them together so you can see the interaction. Deploy to a device so you can see what it feels like in your hand. Acorn ($) – A strong competitor to Photoshop, only way cheaper. I find myself reaching for Photoshop less & less these days. Under active development. Sketch ($) – A vector-based drawing tool that is increasingly useful these days, as screen sizes and pixel densities change. It is often helpful to design once and have the freedom to scale up & down as needed. Also sports a really powerful export system. For some example Sketch projects, check out Sketchmine. See my screencast on Sketch for a live demo. iOS 7 PSD by Teehan+Lax – A super handy resource if you (or your designer) uses Photoshop. An iOS 6 version is also available. Bjango’s Photoshop Actions – A definite time-saver if you use Photoshop to design iOS apps. One click access to resize canvases, scale by 200% (or 50%), set global lighting to 90º, and more. Their blog also has a bunch of useful Photoshop workflow tips. xScope ($) – An indespensible swiss-army knife of tools such as guides, pixel loupes, screen rulers, and more. Want to know what color value that pixel is? Want to see how many pixels between a button and the window for a random Mac app? xScope has you covered. Also check out their companion iPhone app for mirroring designs you’re working on and seeing them in pixel-perfect glory on your iDevice. Glyphish ($) – A fantastic collection of high quality icons for your iOS apps. Apple doesn’t provide a lot of built-in icons, so it’s handy to have a collection of icons covering all kinds of various concepts. I’m still looking for a use for that baby icon though. Glyphish comes in packs, and the latest pack has iOS 7 “thin line” icons which will be very handy when designing an iOS 7 app. Fontastic Icons for iOS – An open source set of classes for utilizing icon fonts, such as Font Awesome in your iOS app. Quickly and easily have an icon in whatever pixel dimensions you require. Since fonts by nature can be scaled up and down with ease, this makes a really nice way to ship & use your icons without having to export multiple versions for the sizes you require. PaintCode ($) – A vector-based drawing tool that exports your artwork as the equivalent Core Graphics source code. Awesome for learning how Core Graphics drawing works, but also incredibly handy if you want your drawing to be dynamic. See my screencast on PaintCode for a live demo. Edge Insets ($) – A simple tool that helps you define your edge insets for repeatable images. Available on the Mac App Store. LiveView – A remote screen viewer for iOS, making it easy to immediately see your designs on a device. Thanks, @_funkyboy! Skala Preview ($) – Another excellent tool for quickly showing your designs off on a real device. The guys at Bjango are awesome and this app is deserving of the price. Thanks, jn40! Git – If you’re not using source control stop what you’re doing and rectify that. I use git for everything I do and love it. Kaleidoscope ($) – The best diff/merge tool around. Does 3-way merges and is beautiful to look at. I use it every day. p4merge – A free, ugly alternative to Kaleidoscope. Powerful 3-way merge, but good luck finding the download link. It’s hidden deeper in their site every time I look for it. Git X – A simple, powerful GUI tool for visualizing git timelines and quickly & easily staging commits. I usually live in the Terminal for git usage, but fall back to this app when I need to stage hunks of changes into logical commits. This is a fork of the original (abandoned) GitX, which I found on this list of forks. Source Tree – A free, full-featured Git application. I don’t use this because I favor the command line, but if a GUI tool is your cup-o-tea, check this app out. pngcrush – This little utility can crush & uncrush PNG files, which is handy when you want to view images contained in app bundled distributed in the App Store. Just open iTunes, view the local Apps list, and right click on any icon to Show in Finder. Once there, open up the app and you’ll see a bunch of PNG files, but you can’t view them. Using pngcrush you can extract the full version so it can be opened with Preview. appcrush.rb – This handy little ruby script will automate the above process for all images. Just point it to a .app file on your disk and it will extract all the images to a folder on your desktop. Handy for seeing how apps on your phone accomplish certain designs. Check out my screencast on dissecting apps for a live demo. Charles ($, free limited demo) – I don’t know what’s going on with the ugly UI or icon, but Charles is an essential tool for any developer. Charles acts as a proxy to allow you to inspect your network traffic to & from the iPhone Simulator. You can also inspect traffic from your device by setting your phone’s proxy to your Mac running Charles. With self-signed SSL certificates, request & response breakpoints, and request/response viewers, Charles is really amazingly powerful. A must-have tool. Again, my screencast on dissecting apps covers this well. I know what you’re thinking, don’t all iOS developers use Xcode? Well mostly, yes. But with my love/hate relationship with Xcode, I believe there is tremendous value in considering alternatives. AppCode – A full-fledged IDE from Jetbrains (makers of the excellent ReSharper for .NET). Immensely powerful refactorings & features that help you write code faster. Quickly identify dead code, automatically insert #import statements when you use related code, easily extract variables, methods, and classes. My only wish for this app is that it would instead be a plugin to Xcode. Xvim – An Xcode plug-in that gives you vim keybindings. Works well, ‘nuff said. KSImageNamed – Another Xcode plug-in, this one allows you to autocompleted image filenames from your bundle when typing [UIImage imageNamed:…]. Great way to avoid the inevitable typo that causes this method to return nil and you to subsequently waste 10 minutes trying to figure out why your images aren’t displaying. 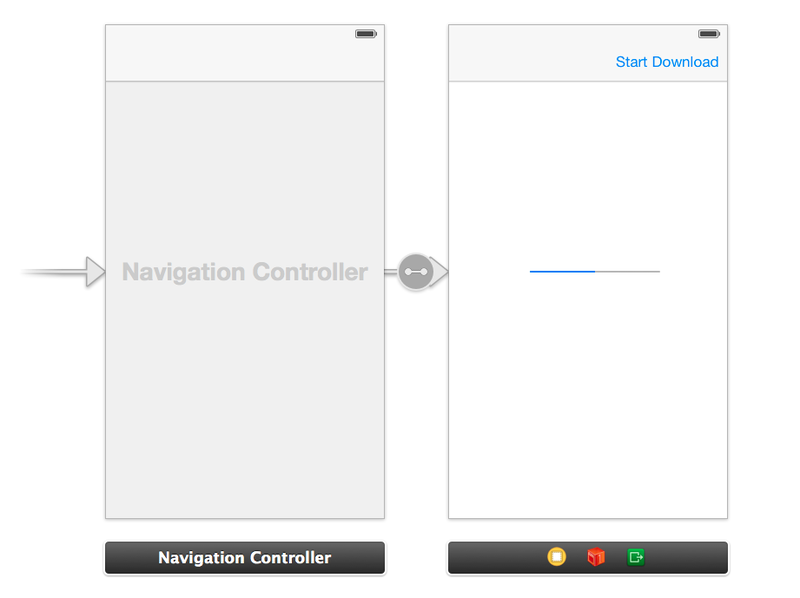 CocoaPods Xcode Plugin – This plug-in adds a menu item for interacting with CocoaPods. Useful if you don’t like dropping to the command line. Alcatraz Package Manager – An awesome meta plug-in that allows you to easily install other Xcode color schemes and plug-ins with a single click. Code Runner ($) – a light-weight code-aware text editor that knows how to compile & run code in most languages. Want to test out a quick snippet of Objective-C code and don’t want to create an entire Xcode project to do it? Code Runner to the rescue. Ahhh, documentation, everyone’s favorite topic. Even still, documentation is really important to have, so pay attention so we can make your life easier. appledoc – Want to automatically generate documentation that look’s like Apple’s? Look no further. Automatically inter-links symbols defined in your project as well as extracting discussion to output using specially formatted code-comments. Generates official docsets and HTML web sites. Dash ($) – A must-have API documentation viewer and code snippet manager. This tool is really handy as it allows you to download & search API docs for all kinds of languages & frameworks with lightning speed. The fastest way to get access to the docs. I integrate Dash with Alfred to make searches even faster. CocoaPods – The essential tool for Objective-C projects. Allows you to quickly & easily integrate 3rd party libraries into your application. It does so by creating a second static library project and automatically links this with your projects. There are thousands of pods available, and it’s easy to add support for libraries that you don’t own (or perhaps are private). I use CocoaPods in every single project I work on. At some point our app is in the field and we need to understand better what’s going on, maybe to fix bugs or to improve performance. DCIntrospect – crazy powerful tool that you’d link inside your app when running in debug and on the simulator. Once you do, you can press the spacebar to get some really helpful view debugging support. See exact dimensions of elements on the screen, print out view hierarchies, even nudge views horizontally or vertically. Pony Debugger – another tool you’d use by embedding a library in your debug builds, Pony Debugger actually utilizes Chrome’s dev tools for seeing network requests coming out of the device, as well as a rudimentary Core Data browser. It’s hard to describe, but check out my screencast on Pony Debugger for more info. Runscope ($) – Runscope is a service running online that can capture requests, log details, and give you valuable data about your API. Simple to set up, as it’s an HTTP pass-through API, all you need to change is your host name. SimPholders – Quick, easy access to your simulator folders. Browse by iOS version, then app name and jump right to the folder in Finder. Spark Inspector ($) – Debug your view hierarchy running on your app in debug mode, in 3D. This app really has to be seen to fully understand the value, but it can really help to understand what views are used to compose your app. Also contains a notification center inspector, so you can easily see what NSNotifications are firing and who is observing them. Another app to look at that is similar is Reveal. ImageAlpha – A Mac app that allows you to convert a 24-bit PNG with transparency to an 8-bit PNG with an alpha channel. Typically 8-bit PNGs don’t have an alpha channel, so if your image can be represented in 8-bits (say, a solid color button) you can save a lot on storage by converting the 24-bit PNG to 8-bit using ImageAlpha. ImageOptim – Another Mac app that compresses PNGs in order to save space. Most PNG files can shave off a few % of the size, and sometimes you’ll shrink the files by 30% or more. Smaller images mean smaller app sizes and less memory used to load them at runtime. Prepo – A little Mac app that can quickly resize artwork in all the various sizes you might need. Just drag a large icon file (say, 1024×1024) onto Prepo and watch it spit out 512×512 iTunesArtwork, 114×114 Icon@2x.png, and all the other sizes & filenames you’d expect. Slender ($) – an awesome app that analyzes your app and finds all sorts of problems, such as missing retina artwork, unused images, image that could benefit from compression and more. Shave kilobytes off of your iPhone app by shedding unused images with Slender. Mogenerator – still a super useful tool for generating smart subclasses of your NSManagedObjects in your Core Data model. Some use Xcode for this, and resort to manually subclassing or creating categories in order to add logic to the models. Mogenerator runs as a quick pre-compile script to generate subclasses for you to use. It does this by creating an underscored version (_User) and a regular one for you to modify (User). Base ($) – there will come a time when you need to inspect your actual Core Data sqlite database to see what’s going on. You can use the sqlite3 command line tool, but Base offers a nice looking GUI browser. Just don’t vomit when you see the database schema that Core Data created for you. Core Data Editor ($) – for more advanced data anlysis, exploration, and modification you can use Core Data Editor. This app understands Core Data, so you’re working directly with the entities instead of database rows. Ultimately your iOS app will likely want to talk to a server to share data, fetch new content, send push notifications or whatever. While this can be accomplished manually, you might want a more drop-in solution. Helios – Helios is an open-source framework that provides essential backend services for iOS apps, from data synchronization and push notifications to in-app purchases and passbook integration. Built on top of many open source ruby gems, so you can pick & choose and build your own stack if you so desire. Take a look at the Nomad CLI set of handy related tools as well. Urban Airship – I’ve been using Urban Airship to deliver push notifications for a while now. Really easy to integrate with, and small usage is free. Parse – This is another data-in-the-cloud service, but offers an impressive API and online data browser. We use Parse for a really small app and works well for that. There are other players here, but none that I’ve seen have been compelling enough to switch from flurry. I’m open to hearing suggestions, so let’s hear about ‘em in the comments. Flurry – I’ve used flurry for a long time to provide useful analytics on the usage of my apps. Need to know when to stop supporting iOS 5? Flurry gives you the numbers to have a realistic conversation. Deploymate ($) – Need to support iOS 4 still, but you’re compiling with the iOS 6 SDK? Deploymate will warn you when you’re using symbols that don’t exist in your deployment target. Cupertino – Part of the Nomad CLI tools, Cupertino gives you command line access to managing devices & profiles in the Apple Provisioning Portal. For example, just type ios devices:list to see the current list of devices in your account. Useful for automating lots of processes. Hockey App ($) – A great service for managing the distribution of your ad-hoc builds. Testers can get a link to install new betas over the air. Also provides robust crash reporting so you can easily respond to crashes in your apps. TestFlight – A free service, similar to Hockey App. We’ve used TestFlight with great success for easily distributing apps and collecting feedback from our users. My only wish is that they’d start charging for the service. Also includes analytics and crash reporting, but we don’t use those features. iOS Simulator Cropper – A really easy way to snap images of the simulator, with or without status bar, with or without device chrome, etc. Great for taking App Store or just general marketing screenshots. Status Magic ($) – Take better app store screenshots. Nothing makes your app look less crappy than an App Store screenshot that includes a low battery, or low signal. Status Magic gives you complete customization over what’s present in your status bar, including removing elements, changing the time to “9:41 AM” like Apple tends to do, and more. Crashlytics – Excellent crash reporting for your apps in the field. Automatically uploads dSYMs on release builds so your crashes are automatically symbolicated and organized for you to focus on the most critical ones. I don’t think we as a community focus enough on testing. There are great tools available to us, and most are so easy to use we have no real excuse not to write at least some tests for our apps. Kiwi – A great Rspec-style testing framework for iOS. Built on top of SenTestingKit, so you just type ⌘U to run your specs. Also includes a completely robust mocking & stubbing library as well as assertions. Specta – A light-weight BDD framework very similar to Kiwi, but the expectation syntax has one major benefit over Kiwi: everything is implicitly boxed like this: expect(items.count).to.equal(5). There’s no need to wrap 5 in an NSNumber like Kiwi does. Use in conjunction with Expecta for a bunch of useful matchers. The following are all various ways of performing end-to-end acceptance tests. These tests will actually interact with your interface, touching buttons, scrolling, etc. By nature these will be slower and more brittle, but testing in broad strokes is certainly helpful to see if all of the pieces fit together properly. Reflector ($) – Wirelessly mirror your iOS device on your Mac using Air Play. Great for doing demos of applications on your computer. Placeit – A great collection of high res photos of people using devices, but the screens are templates that you can insert your own screenshots into. Very cool, and great for displaying your app in a nice way on your website. App Viz 2 ($) – a really useful Mac app for tracking sales of your apps. You run it locally and it logs in and downloads your sales reports. App Annie – an online sales reporting tool. I’m less comfortable giving my credentials to iTunes to a 3rd party, but it does keep the reports up to date for you so you don’t have to run an app locally. In the comments, Josh Brown suggests creating a different user for analytics in iTunes Connect, which is a really good idea. These tools don’t have a defined category above, but deserve a mention nonetheless. Quick Radar – Submitting bug reports to Apple is our only way of making their tools better. If you’re frustrated by the lack of a feature, you should be submitting a bug report. If you come across a bug, you should be submitting a bug report. One has no right to complain if they have not yet filed a radar :). With that in mind, submitting bug reports via bugreporter feels like a trip back to 1995. Quick Radar is an awesome little app that makes submitting bug reports super easy. Sports automatic posting to open radar so others can see it, in addition to tweeting, and posting to App.net. I use this app several times per week. Keep Reading and Experiment on your code…. This tutorial will show you how to use the background transfer service, a Multitasking API provided by iOS 7. I’ll teach you how to create an app that will download a file without the application in the foreground. Once the file fully downloads, a notification message will pop-up. Continue reading to create this service! Background transfer service originated with iOS 6. This feature allowed apps to transfer files in both foreground and background modes, but limited the minutes. The biggest problem was when the “limited minutes” did not allow the user to download or upload large files. This is why Apple improved the framework in iOS 7. Now change the view for the ViewController.m. A warning will appear, but don’t worry about it; we’ll fix it later. Go back to the Main.Storyboard and connect the objects with the properties and actions. This step is trivial, but if you have any concerns feel free to use the comment section below. The NSURLSession class and related classes provide an API to download or upload content via HTTP. This API is responsible for managing a set of transfer tasks. You will need to create three objects that directly relate with that class: oneNSURLSession, NSURLSessionDownloadTask, andUIDocumentInteractionController. The properties we’ll add are useful to instantiate and manipulate our session and the download process, which will allow you to resume, suspend, cancel, or retrieve the state. The last property, UIDocumentInterationController is used to present the PDF document downloaded in this tutorial. The first task to complete is to add a string to the location of the file to download. You should use a standard Apple PDF. Since you call the backgroundSession method, and it does not exist, you must declare it now. This method is responsible for dispatching one action that will be the background session. The backgroundSession through the dispatch_onceexecutes a block once for the entire lifetime of the application. The NSStringreceived by the NSURLSessionConfiguration represents the ID of our session. This ID needs to be unique for each NSURLSession instance. The (IBAction)start:(id)sender method starts the document download. You will then initiate an NSURL and a NSURLRequest and use the downloadTask property to pass the request object to the downloadTaskWithRequest method. The complete method is below. At this point, you’ll notice that three warnings are present. They state that the protocol method should be implemented. The NSURLSessionDownloadDelegateprotocol defines the methods to handle the download task. To perform the download, it’s required to use the three delegate methods. The (void)URLSession:(NSURLSession *)session downloadTask:(NSURLSessionDownloadTask *)downloadTask didWriteData:(int64_t)bytesWritten totalBytesWritten:(int64_t)totalBytesWritten totalBytesExpectedToWrite:(int64_t)totalBytesExpectedToWrite method is responsible to track the overall download process. It also updates the progressView accordingly. The complete method is below. // For the purposes of testing, remove any esisting file at the destination. Finally, the (void)URLSession:(NSURLSession *)session downloadTask:(NSURLSessionDownloadTask *)downloadTask didResumeAtOffset:(int64_t)fileOffset expectedTotalBytes:(int64_t)expectedTotalBytes must also be declared. But be aware that we wont use it any further. You’re almost done with this class, only two methods remain: (void)URLSession:(NSURLSession *)session task:(NSURLSessionTask *)task didCompleteWithError:(NSError *)error, and - (void)URLSessionDidFinishEventsForBackgroundURLSession:(NSURLSession *)session. The first method informs the delegate that the task has finished transferring data. You should also use it to track any error that occurs. Several errors will appear because you haven’t imported the AppDelegate.h into your class yet. By the way, to restart the counter on the top left at the App Icon, you must add the following line to the (void)applicationDidBecomeActive:(UIApplication *)application method in the AppDelegate. It is now time to Run the app and test the background download. 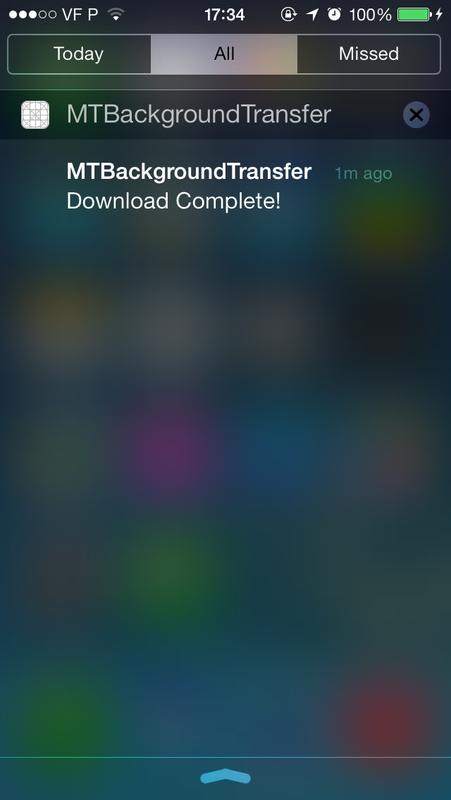 At the end of this tutorial, you should have completed your background transfer service in iOS 7. You should understand the background transfer service and how to implement it. If you have any questions, please leave them in the comment section below. On iOS Programming, one of the most frequent tasks is Manipulation with Files. Using Local Files is one of the most efficient way to store your local data, other ways may include NSUserDefault, Core Data, but local files is very easy to be implemented and organized. 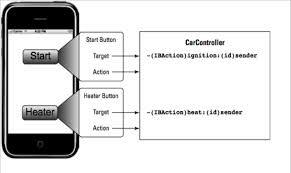 So in this tutorial, we will focus on 5 main manipulation related to Local File on iOS. Before we get started, we first should know what files have been stored in your app’s sandbox. As you might know, every app on iPhone is like an island, usually we name it SandBox. It contains AppName.app, Library folder, tmp folder and Document folder. User usually have their data stored in Document folder if they choose to use local file to store their data because other folders are not designed to store user’s data. So here we use Document Folder to give our test. So, let’s list all the files exists in Document Folder in our Sandbox. // Fetch directory path of document for local application. // NSFileManager is the manager organize all the files on device. // This function will return all of the files’ Name as an array of NSString. // Log the Path of document directory. // For each file, log the name of it. 1, Create a File in the Document Folder. // 1st, This funcion could allow you to create a file with initial contents. // 2nd, You could specify the attributes of values for the owner, group, and permissions. // Here we use nil, which means we use default values for these attibutes. // 3rd, it will return YES if NSFileManager create it successfully or it exists already. 2, Delete a File in the Document Folder. // Have the absolute path of file named fileName by joining the document path with fileName, separated by path separator. // Need to check if the to be deleted file exists. // This function also returnsYES if the item was removed successfully or if path was nil. // Returns NO if an error occurred. 3, Rename a File in the Document Folder. 4, Read a File in the Document Folder. 25 /* This function read content from the file named fileName. 5, Write a File in the Document Folder. 35 /* This function Write “content” to the file named fileName. // Check if the file named fileName exists. // Since [writeToFile: atomically: encoding: error:] will overwrite all the existing contents in the file, you could keep the content temperatorily, then append content to it, and assign it back to content. // To use it, simply uncomment it. // Write NSString content to the file. // If error happens, log it. // If the file doesn’t exists, log it. // since the system will atomatically create it for you if it doesn’t exist. Also, similar API applies to URL and Directory. Check Apple’s Doc for more details. That is pretty simple, specially if you don’t forget to associate the UISearchBar’s delegate! Next, I tried the same with the scope bar but it didn’t work – the scope bar wouldn’t appear. During my testing, I tried to start with the scope bar displayed and then hiding it after the first edit… it worked but when disappearing the search bar would preserve the height as if it was still showing the scope bar! that a developer doesn’t have to re-invent the wheel for every situation. They also give developers a common vocabulary with which to get across high-level ideas with minimal explanation and full understanding. Design patterns are everywhere in iOS Developement,Because iOS is a fairly specific platform, developers often face similar problems over and over, so there are a few design patterns that are extremely common in iOS. The Abstract Factory pattern provides an interface for creating families of related or dependent objects without specifying their concrete classes. The client is decoupled from any of the specifics of the concrete object obtained from the factory. The Adapter design pattern converts the interface of a class into another interface that clients expect. Adapter lets classes work together that couldn’t otherwise because of incompatible interfaces. It decouples the client from the class of the targeted object. The Chain of Responsibility design pattern decouples the sender of a request from its receiver by giving more than one object a chance to handle the request. The pattern chains the receiving objects together and passes the request along the chain until an object handles it. Each object in the chain either handles the request or passes it to the next object in the chain. The Command design pattern encapsulates a request as an object, thereby letting you parameterize clients with different requests, queue or log requests, and support undoable operations. The request object binds together one or more actions on a specific receiver. The Command pattern separates an object making a request from the objects that receive and execute that request. The Composite design pattern composes related objects into tree structures to represent part-whole hierarchies. The pattern lets clients treat individual objects and compositions of objects uniformly. The Composite pattern is part of the Model-View-Controller aggregate pattern. The Decorator design pattern attaches additional responsibilities to an object dynamically. Decorators provide a flexible alternative to subclassing for extending functionality. As does subclassing, adaptation of the Decorator pattern allows you to incorporate new behavior without modifying existing code. Decorators wrap an object of the class whose behavior they extend. They implement the same interface as the object they wrap and add their own behavior either before or after delegating a task to the wrapped object. The Decorator pattern expresses the design principle that classes should be open to extension but closed to modification. The Facade design pattern provides a unified interface to a set of interfaces in a subsystem. The pattern defines a higher-level interface that makes the subsystem easier to use by reducing complexity and hiding the communication and dependencies between subsystems. The Iterator design pattern provides a way to access the elements of an aggregate object (that is, a collection) sequentially without exposing its underlying representation. The Iterator pattern transfers the responsibility for accessing and traversing the elements of a collection from the collection itself to an iterator object. The Iterator defines an interface for accessing collection elements and keeps track of the current element. Different iterators can carry out different traversal policies. The Mediator design pattern defines an object that encapsulates how a set of objects interact. Mediator promotes loose coupling by keeping objects from referring to each other explicitly, and it lets you vary their interaction independently. These objects can thus remain more reusable. A “mediator object” in this pattern centralizes complex communication and control logic between objects in a system. These objects tell the mediator object when their state changes and, in turn, respond to requests from the mediator object. The Memento pattern captures and externalizes an object’s internal state—without violating encapsulation—so that the object can be restored to this state later. The Memento pattern keeps the important state of a key object external from that object to maintain cohesion. The Observer design pattern defines a one-to-many dependency between objects so that when one object changes state, all its dependents are notified and updated automatically. The Observer pattern is essentially a publish-and-subscribe model in which the subject and its observers are loosely coupled. Communication can take place between the observing and observed objects without either needing to know much about the other. The Proxy design pattern provides a surrogate, or placeholder, for another object in order to control access to that other object. You use this pattern to create a representative, or proxy, object that controls access to another object, which may be remote, expensive to create, or in need of securing. This pattern is structurally similar to the Decorator pattern but it serves a different purpose; Decorator adds behavior to an object whereas Proxy controls access to an object. The Receptionist design pattern addresses the general problem of redirecting an event occurring in one execution context of an application to another execution context for handling. It is a hybrid pattern. Although it doesn’t appear in the “Gang of Four” book, it combines elements of the Command, Memo, and Proxy design patterns described in that book. It is also a variant of the Trampoline pattern (which also doesn’t appear in the book); in this pattern, an event initially is received by a trampoline object, so-called because it immediately bounces, or redirects, the event to a target object for handling. The Singleton design pattern ensures a class only has one instance, and provides a global point of access to it. The class keeps track of its sole instance and ensures that no other instance can be created. Singleton classes are appropriate for situations where it makes sense for a single object to provide access to a global resource.